Description: Heavily populated buildings like malls and shopping centers are required to have a fire escape plan, so that people can save themselves from natural or man-made disasters. 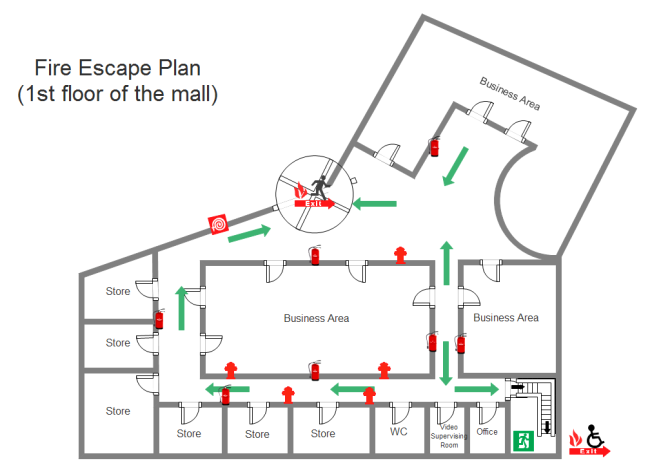 Have a quick start with this flexible mall escape plan template. When you open it, a library of a large collection of related symbol will open together. You can add fire extinguishers, file alarms, fire hose with a single click. Design fire escape plan in minutes by starting with a professionally made fire escape plan templates. You can customize with your own text and images. Edraw professional fire escape plans aim to improve public safety.